I am back from Australia and although I tried to fish near where I was staying the bar was too rough. I also tried another spot called Jumpin Pin, we had a fish from the breakwater and used yabbies for bait but had no luck. I found these four pics on our big camera, they were taken a while ago. The results of great day out from Dargaville when I had to stop fishing after one set because I had my limit. 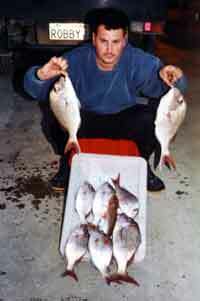 A few snapper, two kahawai and a great haul of gurnard taken on the west coast. We spent the afternoon on the 1st June with 6 other kite fishers and I saw only one gurnard, which we caught, between us all. While the catch was not very good it was a pleasant day on the beach. As daylight waned so did the wind and all except 2 of the kites ended up in the sea. Unfortunately for me, my super kite and skyhook must of had a tussle in the small amount of surf that was building with the incoming tide. Ed : Put a small patch of sail repair tape over the hole and you will get a perfect repair. Don't try gluing it you may damage the cloth. Hi , I went up to the Bay of Islands on Queens Birthday weekend. On Saturday I fished off the rocks at Tapeka Point and while I had some bites I didn't catch anything. My fishing buddy lost a good size snapper of around 15lbs. On Sunday afternoon I went out on a 35ft boat. We stayed out all night and fished up near Cape Brett where we caught a few snapper and a couple of rat kingies of about 7-8 lbs each. We trolled for kahawai on the way back and got half a dozen fish. Hi... You guys run a great site. 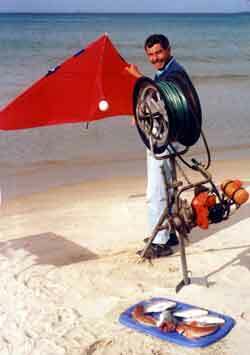 I am learning quite a bit about kite fishing from here in New Jersey in the USA. I especially like reading the Nathan Kean stories, since as you can see, we share the same name, and I have never encountered another Nathan Kean!! Please let Mr. Kean know that his fishing exploits are being followed here in the United States. Again, you run a very fascinating site! !